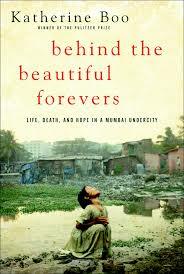 Behind the Beautiful Forevers is a creative non-fiction book written by Pulitzer Prize winning reporter Katherine Boo. She spent three years living amongst some of the world’s most forgotten people in a Mumbai slum. This book is a novelized version of the things she saw and experienced. The stories she told were haunting, and more than once I had to take a break in my reading to wipe away the tears. I won’t soon forget the people in this book, or the fact that they’re not just characters. These are their actual lives, and their own words are used to describe those lives. I hesitate to recommend this book only because it was just overwhelmingly sad. There were virtually no bright moments in these people’s lives, and certainly nothing has changed in the months since she wrote it. These are stories that need to be heard, but I know most people would rather turn away. This entry was posted in book reviews, books, memoir, non-fiction and tagged boo, book review, books, non-fiction. Bookmark the permalink.